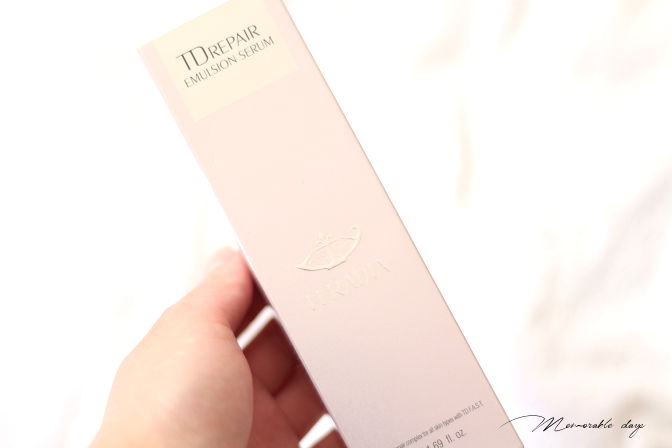 Review: Teradia TD Repair Emulsion Serum | Memorable Days : Beauty Blog - Korean Beauty, European, American Product Reviews. Nano diamond cosmetics, have you heard of that before? 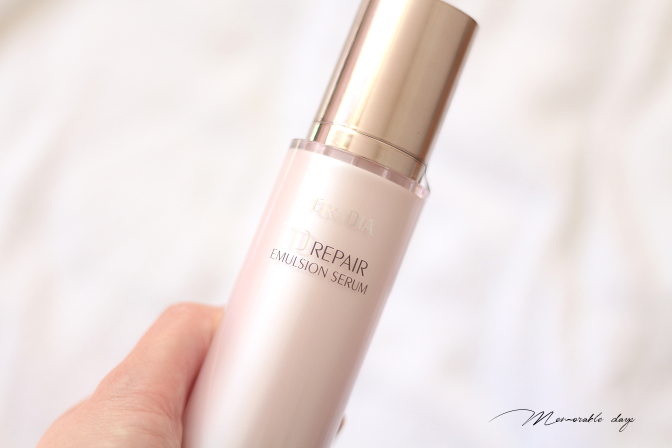 Today I am going to review the TD Repair Emulsion Serum of the Korean brand Teradia. 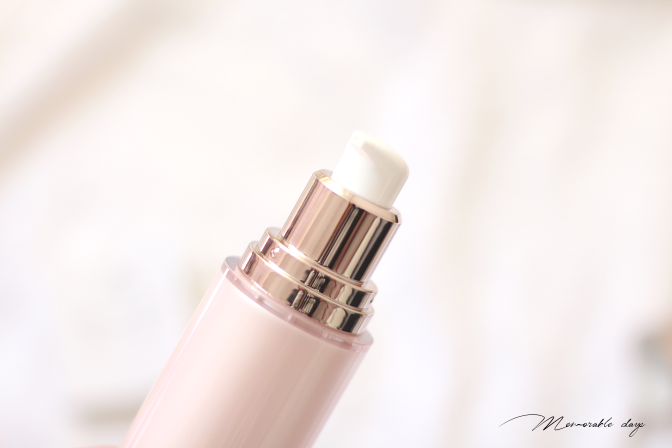 It's a high-end brand and to be honest I never heard of the brand before but I did wanted to give it a try because of the ingredients that's inside! YES! NANO DIAMONDS! Keep on reading today's post if you are interested. Teradia is using Nano diamond in their skincare lines. "Nano sized diamond, which is the smallest size available on Earth, is a yellow colored spherical object that looks like a chestnut burr covered with around 30,000 bumps, and is a very small particle with 1/100,000 the size of hair thickness - this is invisible under naked eyes. Many bumps of this chestnut burr safely hold active cosmetic ingredients and release them, which allows continuous delivery of effects within the skin, and does not get absorbed by the skin but instead stays, continuously exhibiting moisturization, antioxidant and antibiotic function." - source: teradia.co.kr. 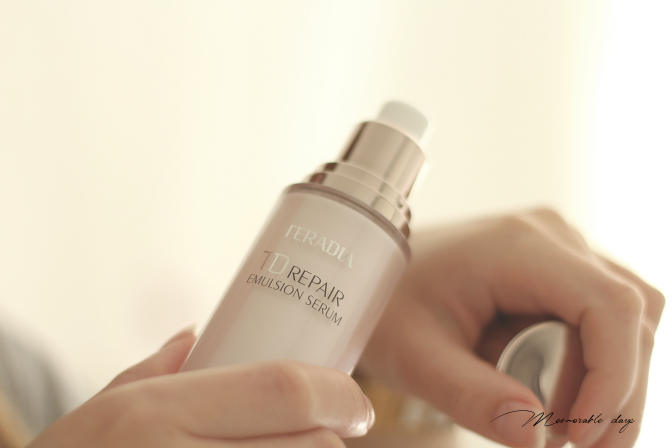 This emulsion serum moisturizes and improves the elasticity of the skin because of Teradia's crystallized water that's included. 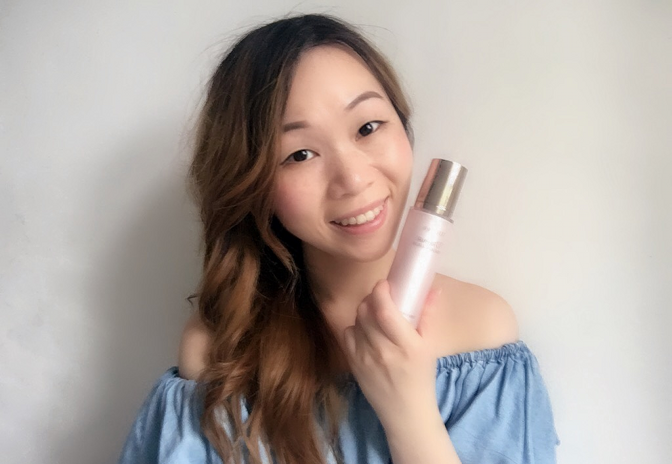 It claims to brighten and lighten the skin because of the nano-diamond ingredient, it's a concentrated serum and a soft emulsion, so there you go, two effects in one. It contains anti-aging benefits as well. Suitable for all skintypes, 50ml of product inside. The packaging is pearly pink and silver colored. It looks high end and the packaging is sturdy as well. It comes in a pump so you can easily get the product out. The packaging is all in Korean. 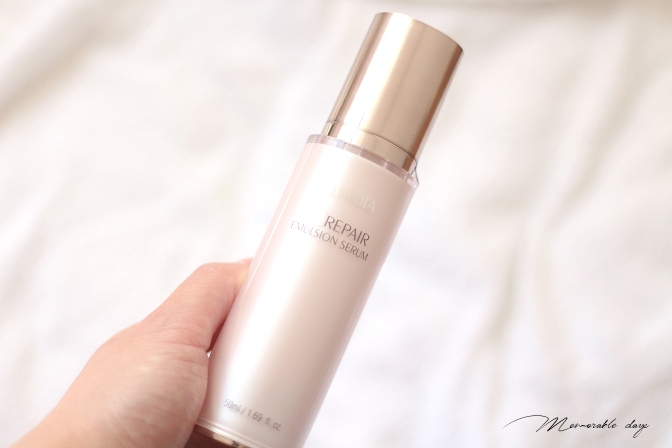 After using an ampoule, pump the emulsion serum 1-2 times and spread it over your face and neck. Let it absorb and move on with your skincare routine afterwards. You should use it within 12 months after opening. A massive ingredient list, check out the ingredient list on cosdna.com as well, here you can see if some ingredients might irritate your skin. Rosa Damascena Flower Water, Water, Butylene Glycol, Mineral Oil, Propylene Glycol, Niacinamide, 1,2-Hexanediol, Palmitic Acid, Polysorbate 20, Stearic Acid, Glyceryl Stearate, Cetyl, Alcohol, Stearyl Alcohol, Phenoxyethanol, Dimethicone, Carbomer, Tromethamine, Ethylhexylglycerin, Adenosine, Diamond Powder, Cananga Odorata Flower Oil, Pelargonium, Graveolens Flower Oil, Theobroma Cacao (Cocoa) Extract, Coptis Chinensis Root Extract, Citrus Aurantium Bergamia (Bergamot) Fruit Oil, Sodium Hyaluronate, Juniperus Mexicana Oil, Eucalyptus Globulus Leaf Oil, Glycerin, Camellia Japonica Seed Oil, Sorbitol, Butyrospermum, Parkii(Shea Butter), Argania Spinosa Kernel Oil, Ascorbic Acid, Plukenetia Volubilis Seed Oil, Allantoin, Tocopheryl Acetate, Panthenol, Hydrolyzed Collagen, Eugenol, Calendula Officinalis, Flower Oil, Mangifera Indica(Mango) Seed Butter, Oenothera Biennis(Evening Primrose) Oil, Hamamelis Virginiana (Witch Hazel) Leaf Water, Propanediol, Coriandrum Sativum (Coriander) Fruit Oil, Rubus Idaeus (Raspberry) Fruit Extract, Portulaca Oleracea Extract, Anthemis Nobilis, Flower Extract, Asiaticoside, Asiatic Acid, Madecassic Acid, Glycyrrhiza Glabra (Licorice) Root Extract, Glutathione, Hesperidin, Alcohol Denat, Linoleic Acid, Citrus Paradisi(Grapefruit) Fruit Extract, Calendula Officinalis Flower Extract, Terminalia Ferdinandiana Fruit Extract, Caviar Extract, Aloe Barbadensis Leaf Extract, Vitis Vinifera(Grape) Seed Extract, Lilium Candidum Flower Extract, Leontopodium Alpinum Flower/Leaf Extract, Convallaria Majalis Bulb/Root Extract, Magnolia, Liliflora Flower Extract, Paeonia Lactiflora Root Extract, Copper Tripeptide-1, TBHQ. The texture is milky and the serum is pearly white. I got to say that it's very easy to spread. It feels lightweight on the skin and it just sinks into my skin as well without having a feeling that it just sits on my skin. This is a thick emulsion serum. The texture is thicker than the normal serums that I am used to, which normally has a more of a liquid/watery texture. 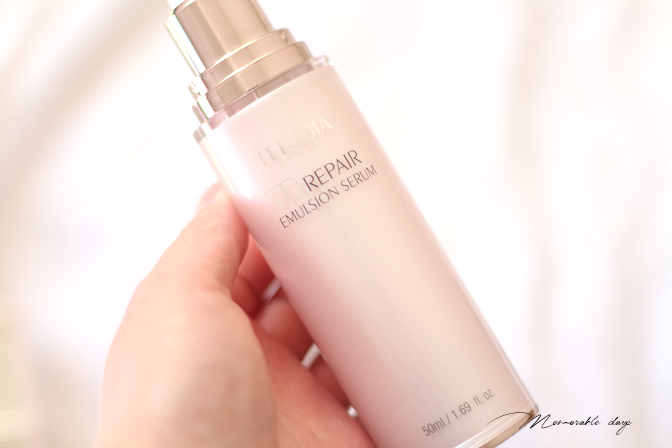 This emulsion serum has a floral scent to it, it's light, not overwhelming. What I do like about this serum is that's not sticky after application and my skin feels moisturized afterwards. You are able to get this serum exclusively at Jolse.com, but unfortunately it's currently out of stock. It's sold for $63,73, which is on the pricey side but it's an high end brand after all and it got to do with the nano diamond ingredients. This was send to me by Jolse for review purposes. I have been using this product for 2 weeks now, which isn't a long time to see any massive difference. My skin does look bright and healthy after application, for about 5 minutes, afterwards it just looks normal. 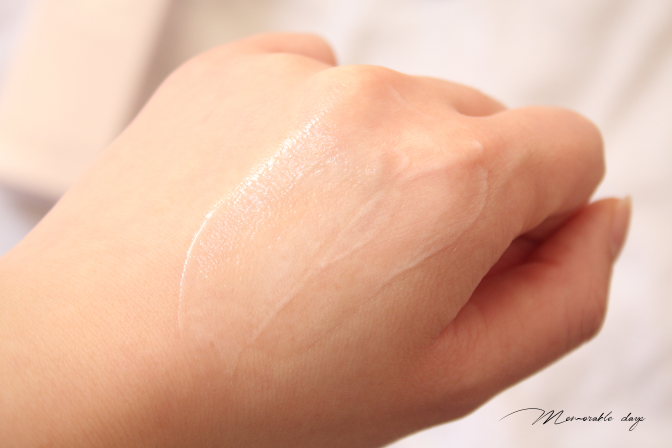 I like the texture of this emulsion serum, it's very easy to spread and just sinks into my skin. It feels moisturizing but I still need to layer it with other moisturizers to make it feel plump. (I have a combination dry skin btw.) It will feel moist enough for people with an oily skintype. So far I think this product is okay, I will be using this product for a longer period to see if there are any differences. I hope this works great for anti-aging, and of course I hope that the nano diamond ingredients will work on my skin! Would you buy it because of the nano diamonds? note: this was send to me for review purposes, but this didn't affect my opinion about the product, see disclaimer.